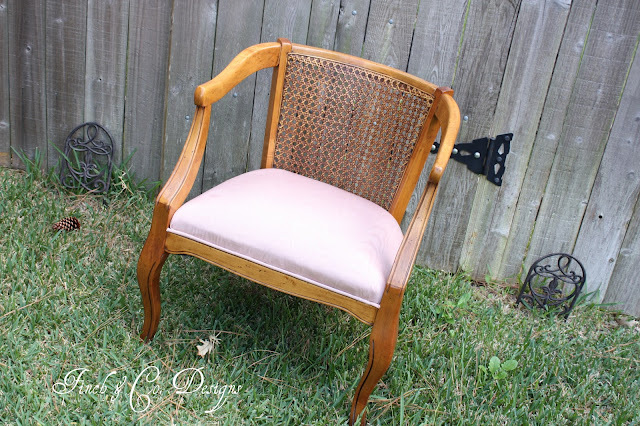 Quite a few months ago I shared this awesome vintage chair that I found a GoodWill. First off I NEVER find anything there and secondly it was in immaculate condition so it had to come home with me. It just needed a make over thats all. Mind you I have NEVER done upholstery before so it sat and sat and sat. I stumbled upon this fun fabric. I admit it is not my norm but I loved all the bright fun colors. It just makes ya smile! :) It reminds me of my friend Jennifer who guided me thru the upholstery process. She is a superhero when it comes to upholstery! I added the upholstery tacks and let me say I was on the verge of throwing things around in the garage trying to get these on. A few dirty words did fly from my lips but hey I was by myself. I had to redo the first row I had started on and they were all bending. I was fit to be tied and then it dawned on me this morning that I just needed to use the smallest drill bit possible and drill pre holes. It worked like a charm! I could have hit myself for not thinking of that earlier. It was certainly a "DUH" moment! 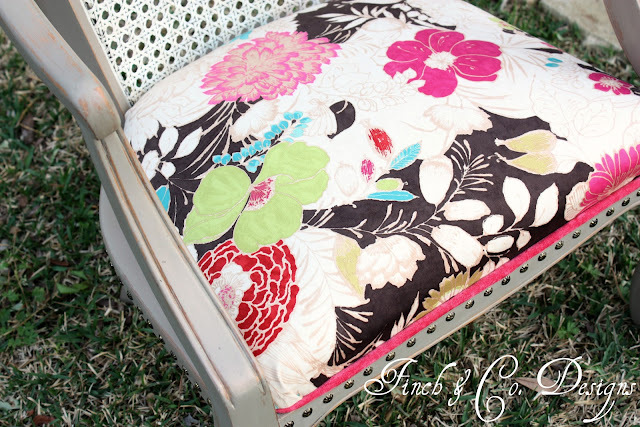 The tacks go all the way around the chair and I just love them because if you look closely you can see that they mimic the floral pattern in the fabric. I think she turned out just fabulous and I am so glad I was able to save her and give her a second life! Don't forget about Treasure Hunt Thursday happening right now! We have almost 60 entries and would love to have ya party along with us! This is SUPER fabulous! 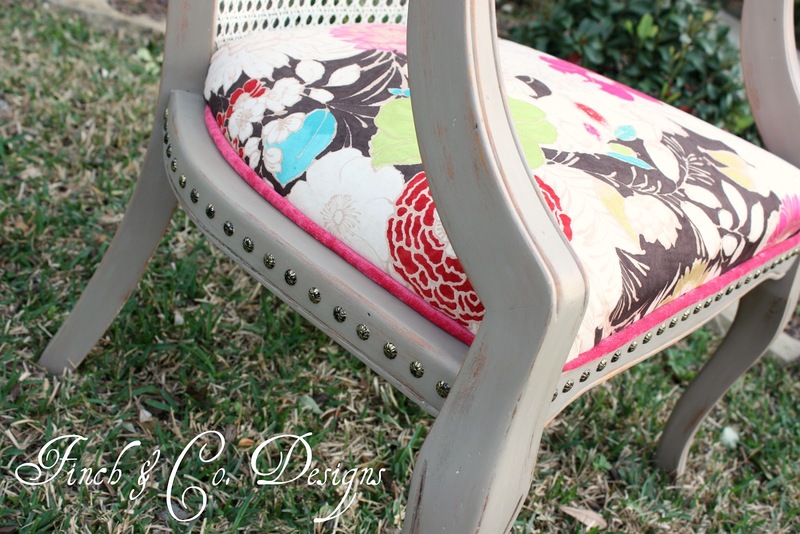 The nail head trim is divine, and the pink cording is darling. 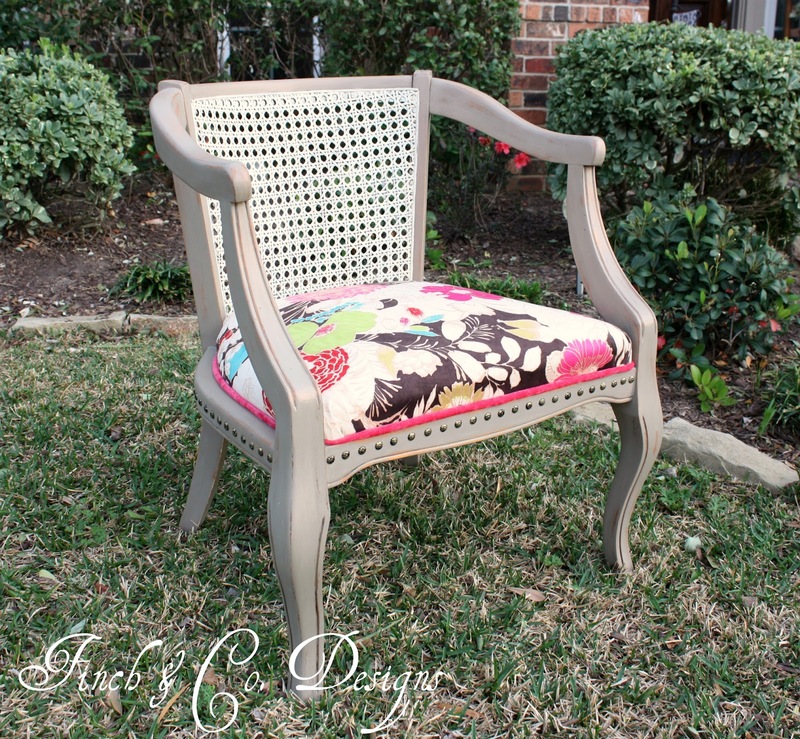 I love the nailhead trim, If I could I would put it on everything, I really like the colors you chose for this chair, It looks fresh and ready for spring. What fun fabric! Love the nailhead trim! What a fun chair. I love the nail heads. Good thinking on the use of the drill. Where will you being putting her? Oh my gosh! This is fantastic! Oh...I love the fabric you chose. Super cute....I'd love to see it linked up at my party...Mod Mix Monday! She certainly does look FABULOUS! What an awesome makeover Pamela and I love the added nailheads! Pamela, I love that chair and it is good to leave our comfort zone now and then. Cute fabric and love the nail heads. I need some for a bench and I keep forgetting about them. I don't know what it is, Pamela, but the fabric, cording and color you used on the chair just make it so appealing! It's very fun looking. I'm sure those upholstery tacks where difficult to work with. Good idea pre-drilling the holes. Love the chair. The fabric is very pretty. Great job. What a lovely job you did! I'm looking for old chairs to revamp for our back patio. We had a $0 budget to get patio furniture, but I want to enjoy this screened in porch while we have it! 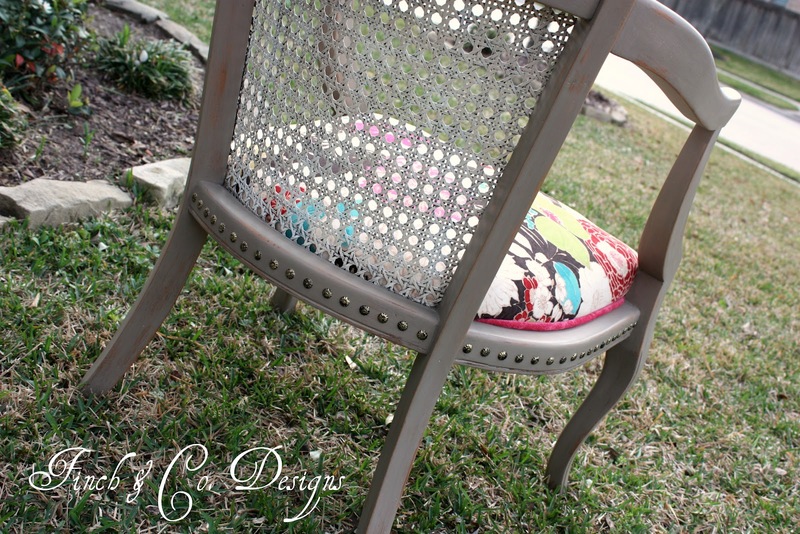 So I'll have to keep my eyes open and look for some chairs that I can revamp too! Jeannie is so cute and I'm delighted you brought her over to play at Potpourri Friday! Hey Pamela, this turned out great! I just finished reupholstering my kitchen chairs and I'm about to post about it probably by tomorrow! I adore this chair and featured it today on my Mod Mix Monday party. This is so darn adorable. I am featuring tomorrow afternoon when the party starts!